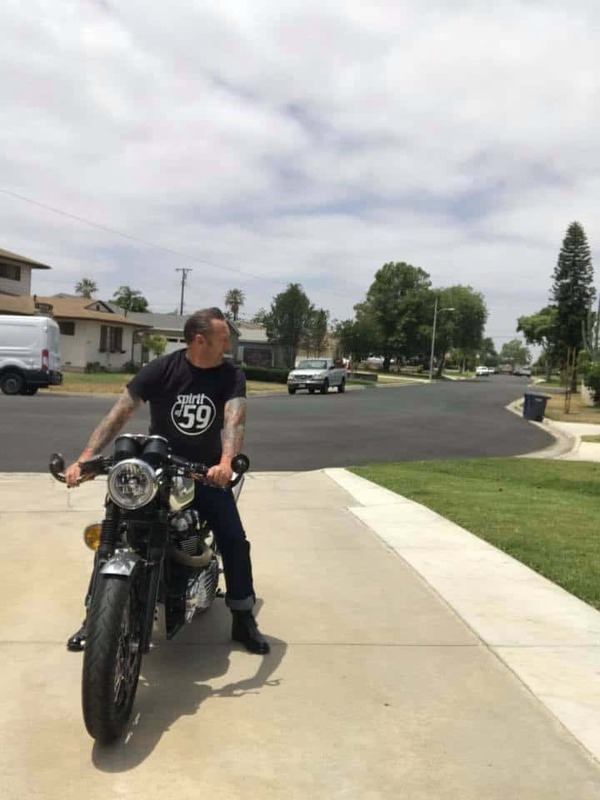 This is my personal Motorcycle , I’m going to be buying a New Machine to Ride with my Girl and my Cafe Bike is now Available. Handles great in corners and will be missed for sure. Been riding up by Grand Canyon and JOSHUA Tree as well as many other places . Been in magazines and some TV stuff and even movie ads. 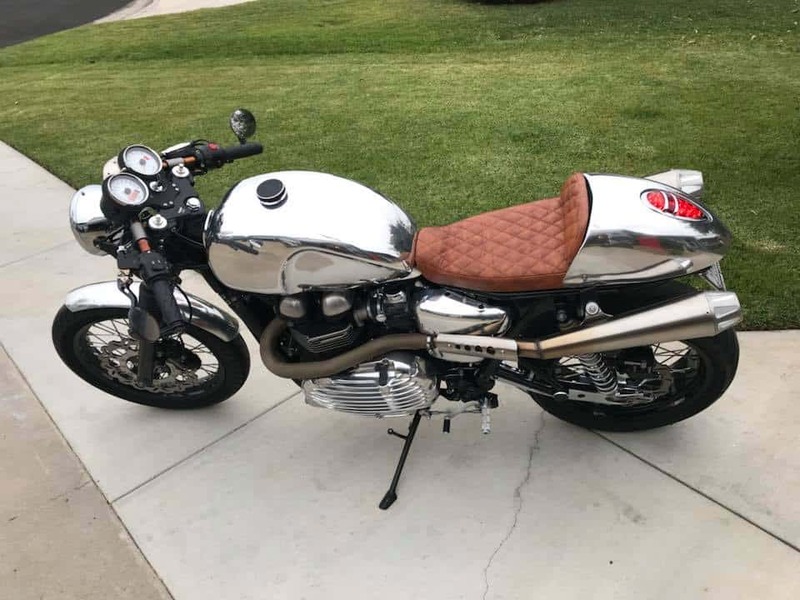 Classic look with Polished Alloy Parts everywhere . 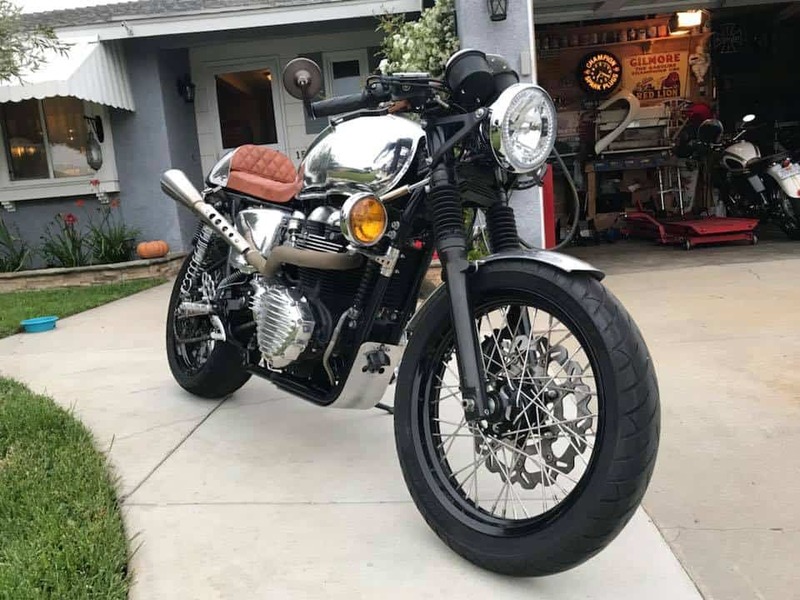 If you like Nostalgia, then here it is with a Capital N.
Many people know this bike and she rides really smoothly, the gear transition is smooth and direct, it has strong linear power due to different sprocket set up and of course it has the power Commander, and the air injection removed, the Zard Pipes make her breathe oh so well. Wave Rotors help slow it down with Custom Berringer 4 pot Caliper at the front is a great set up that is way better than the stock version, I also designed and made the rear Caliper bracket to change the Rear caliper from a bottom mount to a top one, so at least they both look the Status Quo and do not get cluttered up with leaves and road grime like the factory ones do. 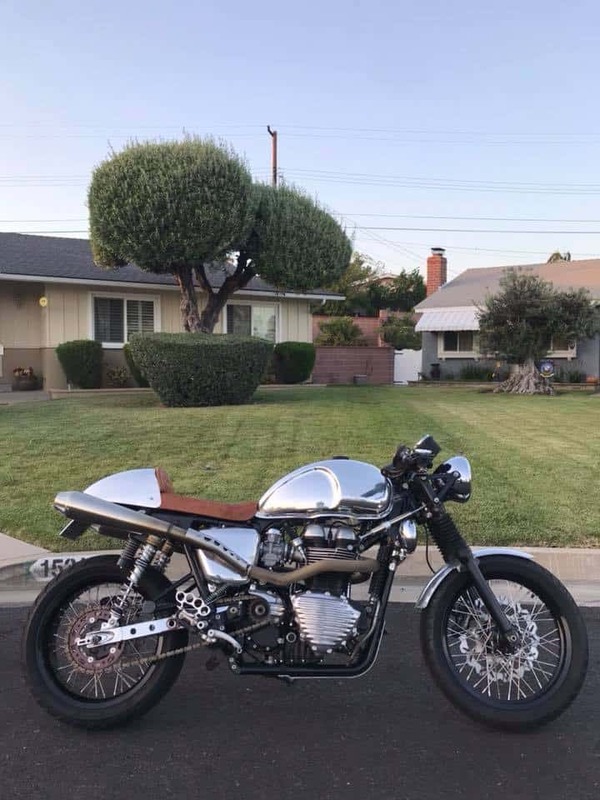 Has a Bigger polished Alloy Motone Gas tank which is a couple of Pints wider and allows for more miles of smiles, I ride it pretty hard and it has tons of Go in her and with them Custom Canyon TT alloy Rims, all that rubber grips the road and gives you so much more maneuverability than the skinny stock rims. The rear wheel is 5.5 inches wide with a nice 170 rear tire of which I am fitting a Brand New one this week. 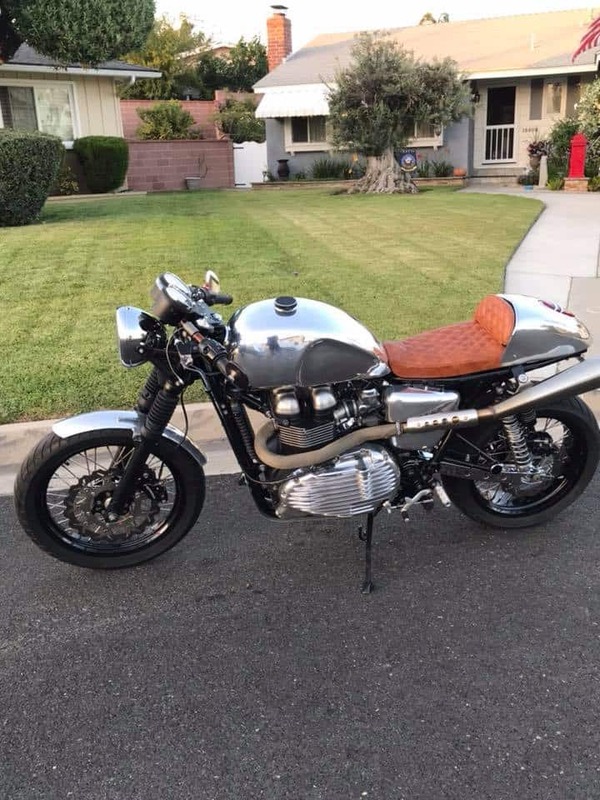 New Leather Seat with Diamond stitching and a hand made rear Allow cowl that has a secret compartment to keep all ya fear in like gloves, goggles, paper work, scarf and tools, of which I use it to store all the time is a bonus here as its so useful. 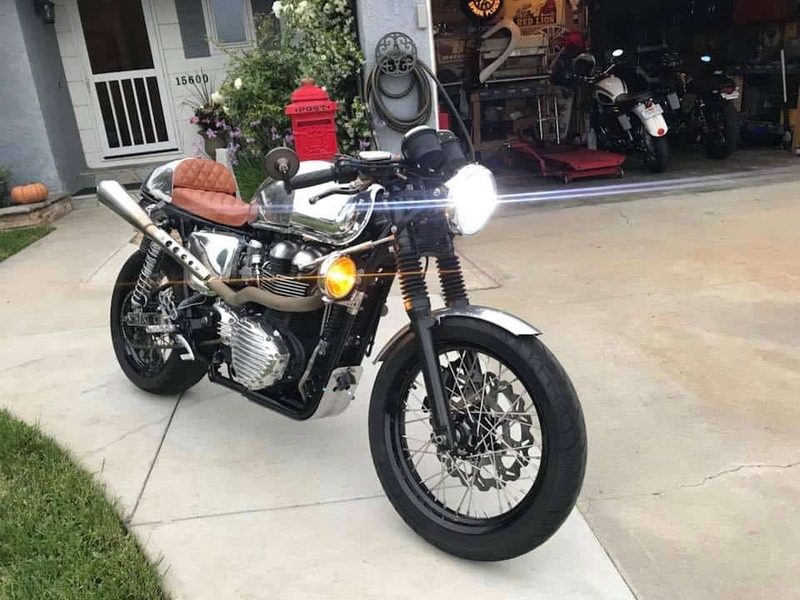 And was the First to Fit a Fog Light set up as I wanted that Old School European look to the bike and have sold maybe 200 of them Fog Light kits since, Be seen is my Philosophy. 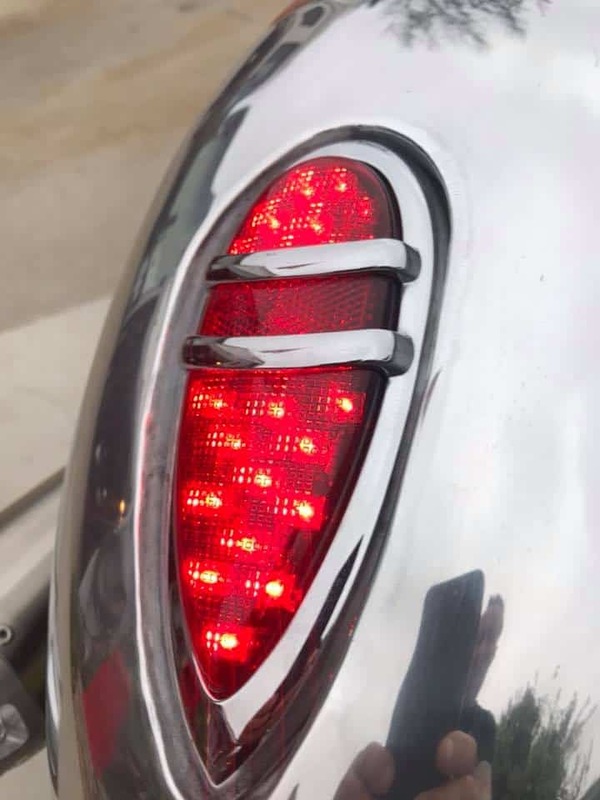 I also frenched a LED teardrop Tail light, it functions as a Running light and a Brake light and its nice and Bright, looks fantastic, also have LED Turn signals front and back to make sure people see which way you are going. 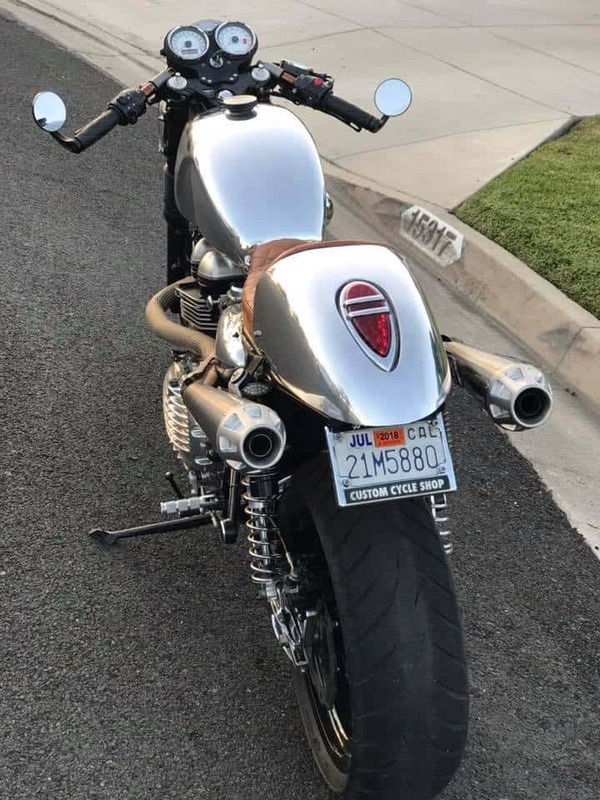 Steering stabilzer at the front soaks up unwanted potholes and the clip on’s are a good fit for the triple tree, I have Custom Grips to so your hands do not tire as well as Custom Mirrors to let you know who is behind you. But also notice I have Works performance shocks, these were $1500 alone and the pipes were another $1500 as well as $3000 for the wheel set up. 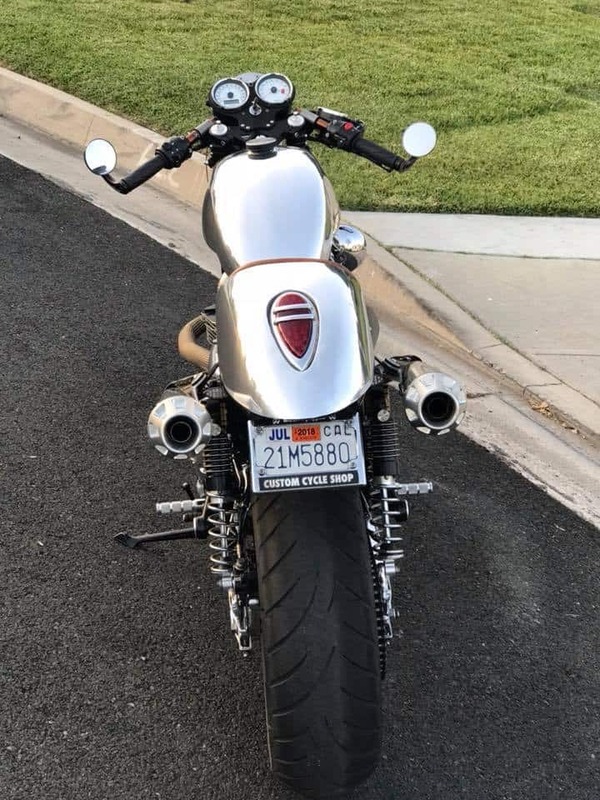 I also changed out the headlight for a 7 inch chrome one and fitted a 6000 Lumens LED bulb and the headlight has LED internal signals that change from clear to amber when you hit the button. Alloy Side cover, and a hand made alloy Bash plate complete the Livery of this TT style machine really well. 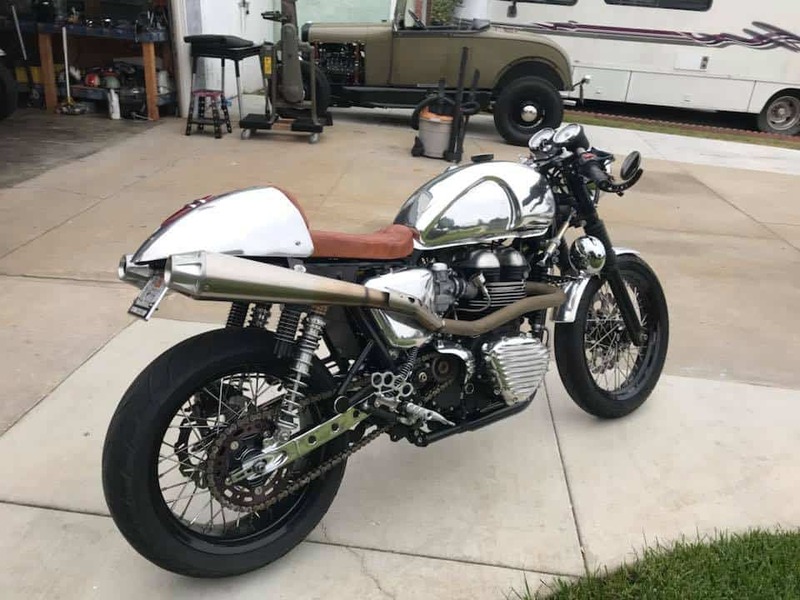 I stripped the stock swing arm and changed it about, drilled the holes and inserted strengthening tubes in the side and then chromed the whole thing and boy does it look cool and sets off that big rear wheel. I also designed and made the Knuckle Duster Heel Guard and have sold many over sea’s, these look great. 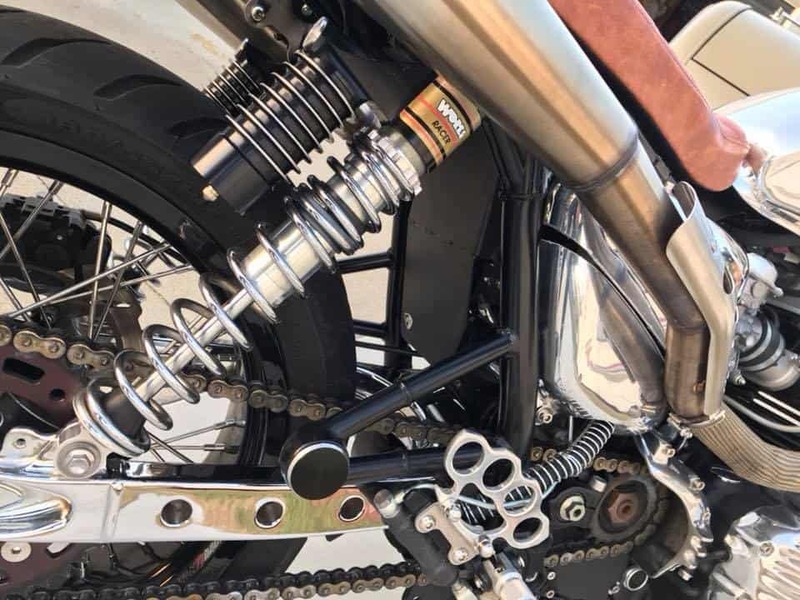 it has form and function and the Zard pipes are stainless and from Italy, they sound awesome as it is now tuned and with the power commander she is great in any elevation too. 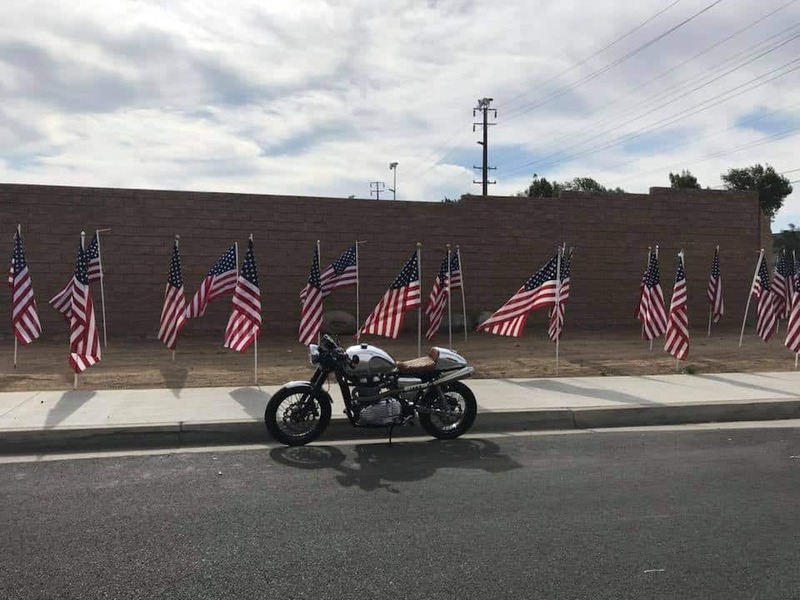 I have done almost 12,000 Miles on the bike and she runs pretty hard, I always use expensive Motul Oil for her as thats what Triumph use, I know its $70 a gallon but I want Longevity out of this engine, no cheap oil for the sake of saving money, good oil and regular services keep this running right. I also only use Triumph Oil Filters and iridium Spark plugs, this has K&N Filters too. 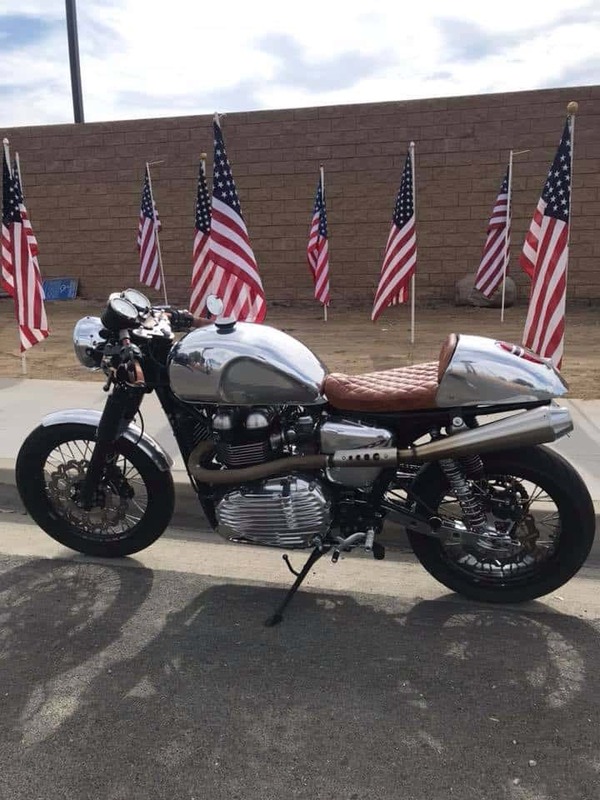 This bike has a lot of character and gets many looks, if I had a bigger Garage I would keep her but, with a few more bikes and a Hot Rod, I simply cannot justify keeping her covered up and it needs a new home. 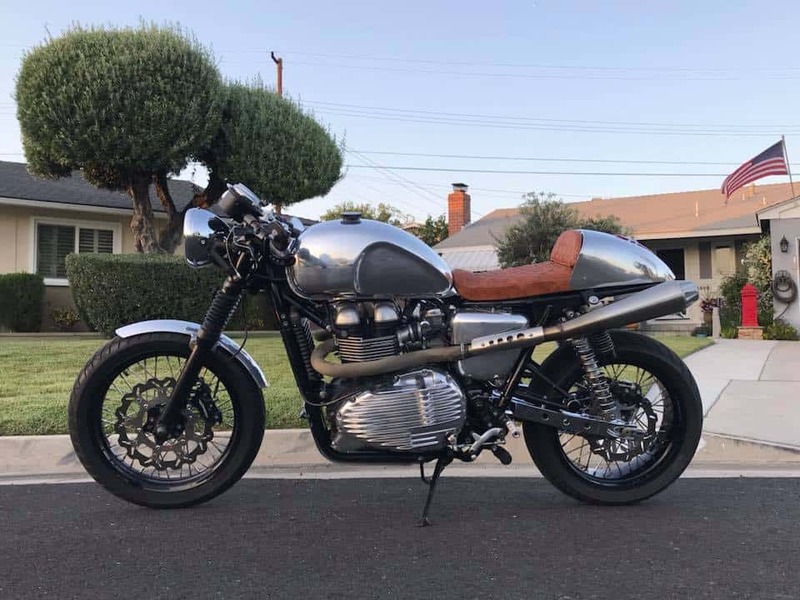 Here is a list of things that I have done or fitted to the bike below. Polished Alloy Tank 2 pints bigger. Custom Leather Seat with storage compartment . Custom Alloy Rear Caliper Bracket that moves caliper to top of Rotor. Beringer 4 Pot Front Brake Caliper. Chrome Headlight with 6000 Lumens LED bulb and LED internal signals. Works Performance $1500 Rear shocks . 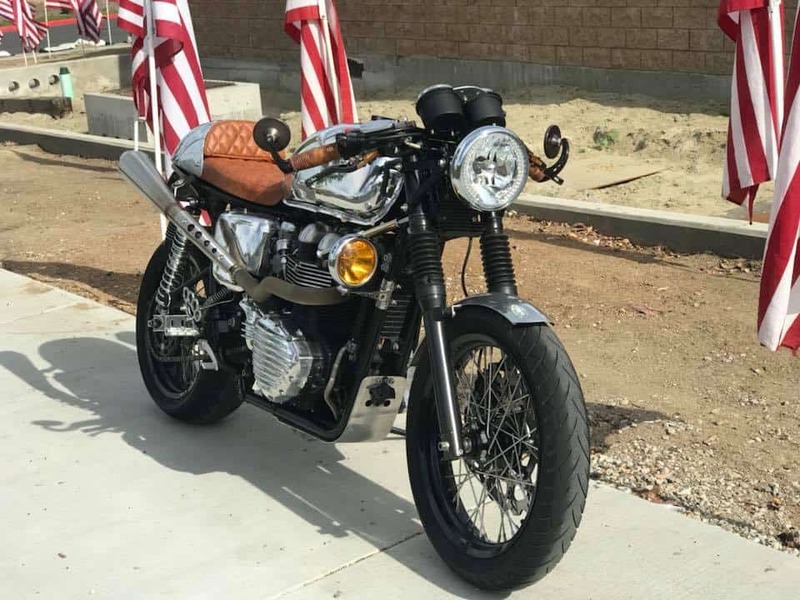 A great Motorcycle that always has made me smile, many many times, but I am looking at a different style machine and this is a good opportunity for someone to enjoy a purpose built cafe racer. It runs great, no oil leaks and is comfortable too. You can email me on carpy@carpyscaferacers.com or you can text or call me on 714-598-8392. 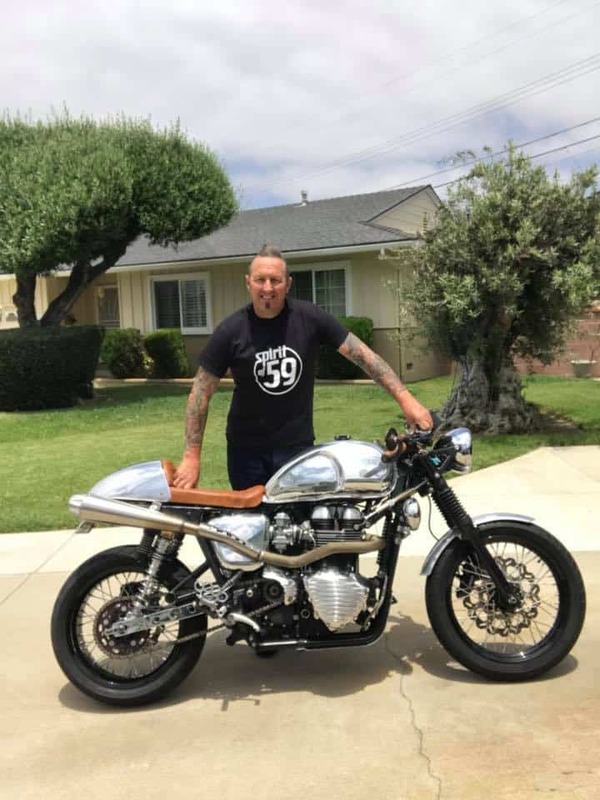 This entry was posted in Blog, For Sale and tagged 900, ace cafe, alloy tank, Bike For Sale, cafe racer, Canyon wheels, Motone, North london, Power Commander, rockers, speed Merchant, thruxton, ton up, triumph, TrumpySpirit of 59, TT rims, works performance, Zards.